This is my character sheet, or design specification, for Daniel, who was an exile carried off to Babylon during the reign of king Nebuchadnezzar. Daniel was given another name, Belteshazzar, by the Bablyonian king’s chief official (Daniel 1:7). The purpose of this sheet is to keep a record of the attributes or characteristics of my drawing, so that I can draw a similar-looking cartoon in all future scenes showing Daniel. I have included a brief personal history on the sheet as well. I first drew my version of Daniel in December 2009, with the “Daniel 06 – The lions’ den – Scene 08 – Into the den ” picture. Although my style has changed a bit since those early cartoons, I try to maintain the same facial features, colouring and clothing style, so that the figure is recognizably that of Daniel, even when months or years have elapsed between drawings. Daniel means “God is my judge”. Nothing is known of Daniel’s early life, except what is recorded in the book bearing his name. He was one of the youths of royal or noble blood, who were exiled by king Nebuchadnezzar to Babylon, in the third year of Jehoiakim, king of Judah. When Daniel was appointed to advise the king, his first activity was to interpret the dream of king Nebuchadnezzar (Daniel 2) of a gigantic statue, made of various materials. Daniel stood high in the governmental service of Nebuchadnezzar, Belshazzar, Darius the Mede, and perhaps also of Cyrus. In chp 5 of the book of Daniel he explains the extraordinary writing upon the wall of Belshazzar’s palace: foretelling the end of the Babylonian empire and the incoming of the Medes and Persians. It was jealousy of Daniel’s favoured position that caused other administrators to plot his downfall, culminating in his night in the lions’ den (Daniel 6). 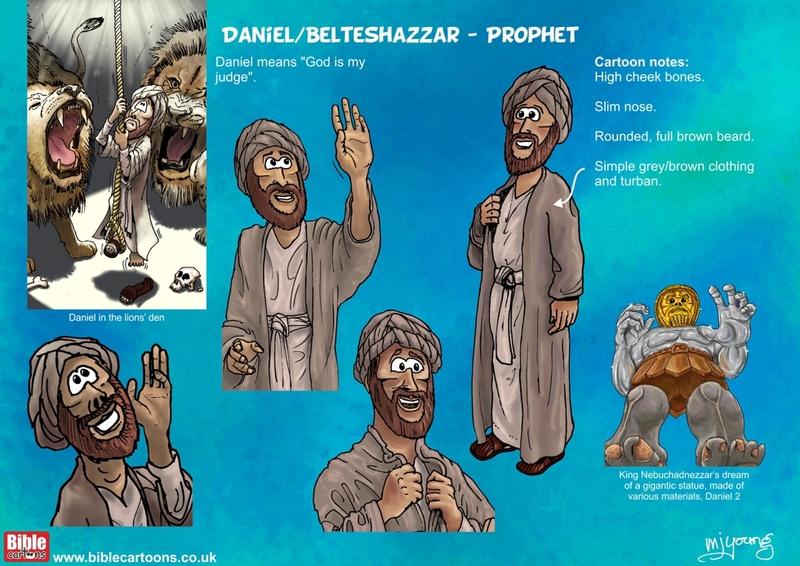 Daniel records 4 or 5 of his own visions (in the last 6 chps of the book of Daniel), all of which are taken up with revelations concerning the future history of great world empires, especially in their relation to the Hebrew people, and predictions of the final triumph of the Messiah’s kingdom.